42 is pleasant experience at times, but is a disappointment on the whole, even with great performances from Chadwick Boseman and Harrison Ford. I would love nothing more than a truly great Jackie Robinson biopic, one that uses the cinematic medium to capture and evoke the spirit of baseball’s greatest hero, but Brian Helgeland’s 42, I am sad to report, is not that film. It has its heart in the right place, features some excellent casting, and delivers several terrific individual moments, but on the whole, 42 exists within the safe, stuffy realm of pandering convention, and is crippled by a lack of focus or meaningful vision. The film follows Robinson’s career from 1945 to 1947, starting with Brooklyn Dodgers general manager Branch Rickey’s invitation for Robinson to join the club’s minor league team, the Montreal Royals, and ending with Robinson’s pennant-winning home run in the last game of his first major league season. It is a logical period in which to set the film, but other than the basic chronological parameters, I am absolutely baffled by so many of the narrative decisions on display, starting with the script’s inexplicable marginalization of Robinson himself. Helgeland introduces too many central characters too early on to begin with, but his insistence on giving figures like Branch Rickey, sports writer Wendell Smith, and Robinson’s coaches and teammates greater agency in Robinson’s success than Robinson himself is an awkward and frustrating choices that hobbles the film from the start. No doubt these and many other people contributed to helping Robinson break down baseball’s racial barrier, which is not a task one man, however extraordinary, could complete on his own, but in a film about the man’s life and professional accomplishments, Robinson should at least feel like the ultimate arbiter of his own success. That balance is only rarely struck throughout 42. The efforts and character arcs of Robinson’s companions are constantly pushed front and center, while Robinson is only allowed meaningful personal agency out on the field, an arena the film shies away from for much of its first half. Helgeland correctly identifies Robinson’s greatest challenge as keeping his cool and playing ball well in the face of overwhelming racial adversity, and when this idea is allowed to fully shine through, the film excels. But away from the diamond, Robinson often feels like a very small chess piece on a large, unwieldy board, a figure who is only allowed to flourish because of the actions of others. Part of my frustration stems from the fact that in Chadwick Boseman, Helgeland has found the perfect actor to embody Jackie Robinson. Boseman is spectacular in the part, embodying the larger-than-life figure with an energetic but always authentic naturalism. 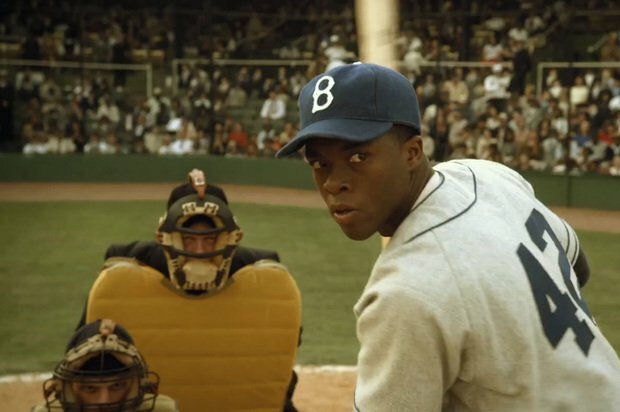 The film is too self-aware in certain stretches about history’s view of Jackie Robinson, but Boseman keeps the character grounded in the moment, portraying a good man who sets out not to change the world, but who merely wishes to play baseball to the best of his ability. He is a joy to watch, and the same can be said of Nicole Beharie as Robinson’s wife, Rachel. She is tremendous at projecting warmth, power, and insight, and shares tremendous chemistry with Boseman. The film’s greatest achievement lies in its illustration of Robinson’s marriage, and the crucial role Rachel and the love the couple shared played in helping Jackie overcome adversity. This is not a theme new to biopics, but it is the one element of the film that does not feel like formula for the sake of formula. For among the many problems plaguing 42, the slavish devotion to convention and ridiculously pandering atmosphere is probably the greatest offender. Every plot and character arc progresses along rigid, formulaic, dramatically oversimplified lines, and Helgeland feels compelled to underline every single thematic point as much as humanly possible, ‘telling’ rather than ‘showing’ at every turn and even exploiting children when need be. For instance: Just in case audiences might miss the significance of Jackie’s first at-bat, the scene is framed through the eyes of an African-American child, who trembles as he sees the white men boo Jackie, and begins praying to God for Robinson to “show them what we can do.” And though the scene that follows is a good one – because it is largely dialogue free and lets Boseman illustrate Jackie’s legendary athletic talents – it is punctuated with the same child explaining to his mother exactly what Jackie did, and why it worked, and why it was cool. Because there is no way audiences would understand the significance of the moment otherwise. Again, I understand the motivation – Jackie was obviously a major inspiration to African American children, and that is an important part of his story – but the execution is just wretched. Since the child is not made into a character (his significance only pays off in a text blurb at the end, which is dramatically unacceptable), his only on-screen purpose is to underline thematic points, and at that point, it just becomes exploitative. The same thing happens with a white kid later on, who is compelled by his father to start shouting obscenities at Jackie from the stands. It’s a cheap emotional ploy, substantively worthless and actively off-putting, and is symptomatic of the film’s broader approach towards driving its message home. Case in point: The music. 42 features one of the most abysmal, inept, emotionally exploitative film scores I have ever heard, and certainly one of the worst of the modern cinematic era. Mark Isham’s compositions are wretched, completely one-note, cloying, and utterly, shamelessly manipulative telegraphing each and ever development, large or small, before it comes. The music is so bad and so over the top in its attempts to squeeze feelings out of the viewer that it winds up shooting the film’s pacing in the foot at every turn, and cripples several major sequences. I often emphasize in my reviews how much music matters, and it is just as true when the score is awful. 42 would be a vastly better film with a different score, or, for that matter, no music at all. The list of bad creative decisions goes on and on. The ending, terrible and unfulfilling, seems as if it were chosen simply as a convenient historical cut-off point, rather than an actual culmination of thematic or emotional fulfillment. The direction and cinematography are aggressively bland and forgettable, and while the baseball sequences are competently shot, the decision to almost entirely ignore Robinson’s fielding is a major gap. Yet in the end, I feel I must end on a positive note, for despite having an overwhelming number of creative issues, only a small number of which I have touched upon here, 42 is not an overwhelmingly bad experience. It is, in fact, a largely pleasant one. 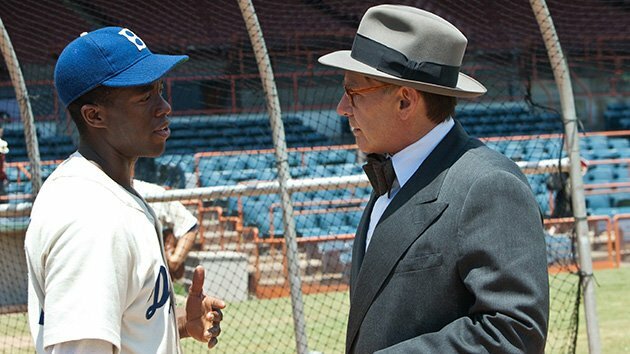 The greatness of Robinson’s story is such that even a poor presentation holds some allure for baseball fans such as myself, and Boseman’s performance – as well as Harrison Ford’s, wonderfully warm and vivid as Branch Rickey – covers an awful lot of sins. Bad writing is always bad, but it can be at least semi-enjoyable when delivered by fine actors, and 42 falls into this territory for much of its run time. Helgeland nails enough big moments to please a crowd, and while I think the film is a failure on the whole, it is a partially enjoyable one. I might recommend this one to baseball fans, though considering that the MLB season just started, time would probably be better spent watching an actual game.